The hallmark of summer is the beaming, bright sun. However, with sun exposure comes drawbacks. While the skin has natural protective mechanisms in place to protect from the sun, sometimes it’s not always enough. So, what does the sun do to your skin? How does it cause problems? For the science behind the sun’s effects on skin, read our comprehensive article below. The sun has UV rays that penetrate the skin. While this is important for vitamin D production, they can also mutate DNA, lead to unwanted pigmentation, and contribute to wrinkling of the skin. The sun’s UV rays cause damage in the skin through two primary mechanisms. Combined, they set the stage for the sun’s adverse effects. Inflammation in the skin secondary to sun exposure manifests as a “sunburn.” This is one of the main mechanisms behind skin cancer and wrinkling. Consistent inflammation in the skin starts the signaling cascade that leads to tissue damage. As a result, wrinkles can appear on the face. UV radiation from the sun can also cause oxidative damage. Exposure to UV rays increases the production of free radicals in the skin. These dangerous molecules can oxidize cellular components like cell membranes, mitochondria, and DNA. Over time, this can cause cellular dysfunction, aging, and even cancer. How Does Melanin Protect the Skin? The natural sun protection mechanism of the body is melanin production. Melanin is a pigment of the skin and it protects the body from UV radiation. Depending on your ethnicity, your skin will naturally contain more or less melanin. Those with innately higher levels of melanin have fewer incidences of skin cancer and photoaging, whereas those with lower levels are at a higher risk. Although all ethnicities will produce melanin in response to sunlight, lighter skin types have trouble producing melanin efficiently. They may also have a genetic tendency to suboptimal DNA repair. Sun protection is important for all ethnicities, however, it is of utmost importance to fairer-skinned individuals. Wearing clothing, utilizing mineral sunscreens, and eating a diet rich in antioxidants are all ways you can protect yourself from the sun’s UV radiation. If you’re already experiencing wrinkles from the sun, anti-aging skin care can help. Antioxidants in skin care can help to combat free radicals that damage the skin, leading to wrinkles. Additionally, exfoliating acids can help to increase skin cell turnover, resulting in a smoother appearance. This can reduce the look and feel of wrinkles. Protecting yourself from the sun’s effects on the skin is a combination of preventing excess exposure to UV radiation and combatting its effects. Mineral sunscreens and protective clothing can reduce UV exposure. Anti-aging skin care products can reduce the appearance of wrinkles and neutralize free radicals on the skin that contribute to wrinkle pathology. 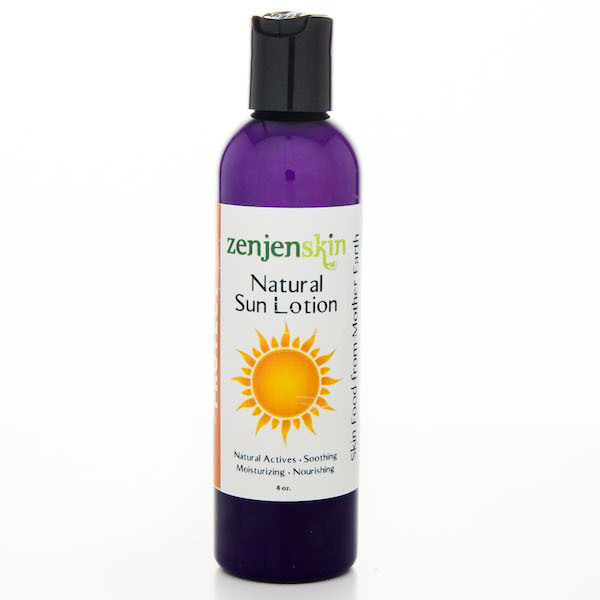 Our Natural Sun Lotion does more than moisturize your skin. It is filled with ingredients to soothe as well as natural sun filters protecting your skin from harmful rays. It feels like a lotion (not sticky) but it is so much more. It is good for you and the Planet. Interested in learning more about healthy skin? Want the scoop on anti-aging? Check out ZenJenSkin.